Recently, I had a chance to check out SmithMicro’s MotionArtist app. It’s been in public beta since last year’s Comic-Con, but now it’s here and stable. Use it to easily create professional looking online comics, complete with animation and powered by the latest in HTML 5 code. It’s not just for comics, but can be set up for presentations and to make animated photo shows. The nice part about it? You don't have to be a web-programming guru. MotionArtist handles all of the coding for you behind the scenes. This is a handy addition to Smith Micro’s products. Poser Pro is perhaps the star of the line-up, widely used to quickly pose and animate easily modifiable 3D characters. There’s even an entire cottage industry that’s sprung around it for selling characters. Anime Studio Pro, meanwhile, is an inexpensive but surprisingly robust 2D animation app that can find a useful place in pro studios. There's also Manga Studio 5, a remarkably full-featured app that allows you to create comic books and graphic novels. Normally, that's a lot to learn, especially if you are new to it. With MotionArtist, however, you simply do it all through its slick user interface without having to write a line of code. MotionArtist allows you to import layered Photoshop files as well as vector artwork created in Adobe Illustrator and lay out the elements in panels that you create in the program using its intuitive comic panel creation tools. When you're ready, simply add dialog using MotionArtist's comprehensive lettering tools complete with vector-based word balloons and dialogue boxes. One of the best features of the software? The ability to build artwork into 3D layers and create a parallax effect, giving your comics a palpable sense of depth. This is essentially a multi-plane effect, which is apparent upon animating the camera. Expect it to work in real time too since the software takes advantage of GPU acceleration. MotionArtist's animation tools help you tell your stories with an easy to use graphical user environment with timeline, keyframes, motion paths and the kind of controls that experienced animators have come to expect. MotionArtist also allows you to apply brushes to panel edges to create a hand drawn style edge. You can add audio, sound effects and other interactive elements too. Besides the ability to export your creation in the web-ready HTML 5 format and embed it into web pages, you can also export the comic in standard digital formats to share on portals such as Vimeo, YouTube or Facebook. 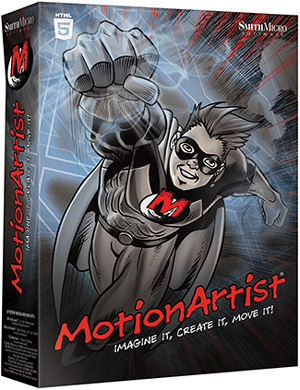 MotionArtist sells for only $50….okay $49.99 as SmithMicro has it. For more information, check out it out on Smith Micro's website.